Tanzania: Zari - Who Says I Dumped Diamond? 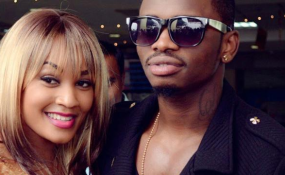 Tanzanian Singer Diamond, Zari Rekindle Lost Love in Zanzibar? Is Ugandan Socialite Zari Leaving Diamond for Cheating? Has Zari Finally Dumped Diamond? Has Zari Made Up with Diamond Platinumz After Cheating Saga? Bongo flava heart-throb Diamond Platnumz and the mother of his two children Zari Hassan pose for a photo. Everyone thinks that showbiz power couple Diamond Platnumz and Zari Hassan have broken up after the cheating scandal that has been a story gold mine for bloggers. Well, everyone but Diamond and Zari. Zari the boss lady has slammed the relationship breakup rumours that have been doing rounds in the blogosphere, no doubt fuelled by her actions of deleting the lovey-dovey photos of her and Diamond on her Instagram page as well as not attending his birthday. She did not even send him a birthday message, the blogs said. 'Normal' couples send each other birthday messages, right? When Diamond confessed to cheating on Zari with video vixen Hamisa and bearing a son with her, it marked the beginning of bitter social media exchanges between the couple, leading to speculation that the two were headed for a split. "Zari dumps Diamond!" the headlines screamed. However, speaking for the first time about the saga away from the social media, the boss lady has confirmed that she is still together with Diamond and that all they are trying to do is take away their love life from the public eye as they work things out. She said, in part: "... I did wish him (a happy birthday) though not publicly via the Whatsup.We're trying to take our personal life away from social media. And the more we trying to take it away from social media the more its reaction on social media but there is nothing like that everything is fine," Zari said in an interview with popular Tanzanian radio programme. Their breakup news has also ignited claims that it would compromise several multimillion endorsement deals that they have signed with several companies including one identified as Gmnetic company that has raised concern. "...There is a little bit of issue going on but there is nothing like that but we do understand the contract we have with Gmnetic company and we will continue to work as per our agreement so there is really nothing to worry about. I mean there is going to be all sorts of drama because we are two big celebrities but when it comes to endorsements we take them seriously because it is our work," she added. Perhaps her latest statement will give credence to the "publicity stunt" rumours'. So, was it all for show? Time will tell. Copyright © 2017 The Citizen. All rights reserved. Distributed by AllAfrica Global Media (allAfrica.com). To contact the copyright holder directly for corrections — or for permission to republish or make other authorized use of this material, click here.